Redesigned for 2007, the Sierra 2500HD is GMCâ€™s heavy-duty three-quarter-ton pickup available in three cab styles: regular, extended cab and crew cab. 4x4 is excellent, suspension very robust. Smooth highway drive, flawless cruise control and great ergonomics (radio controls on steering are superb). Very strong and tough truck. I would of loved a raising and lowing possibility for garages. I am very satisfied with the Sierra. The drive is very smooth, engine is powerful 6 litre v8. cruise control is flawless. Ergonomics are great. seats are comfortable. The 4x4 is superb, handled steep 8 inch snow covered hills easily with the 4 season stock tires, impressive. I bought it mostly to use in the woods. I drive it around 1 hour and 30 minutes on highways to and from the mountains. It is such a comfortable drive that I sometimes prefer it to my Bentley, also being much higher and bigger. Lots of torque for climbing. Robust suspension gives you plenty of confidence on rough terrain. 6 passenger with 8 foot bed, this truck is big. GMC is built so tough and strong. I tried a tundra, GMC is a real truck. Gas mileage is better than expected for such a large vehicle. Looks are very sleek, nice lights and grill arrangement. Onstar is good, I like the extra telephone service for when you forget your phone. The onstar gps is average, I like the real thing better. Mirrors are excellent, good visibility. Overall I am very happy with this purchase, way to go GM. Power, Quiet engine noise. Good ride. Sharp looking truck. #1 injector replaced. Power hose replaced. 8 days in the shop because factory won't stock parts in the country. Cruise control switch doesn't work all the time. Have to step on brake and pull back then reset cruise. North Dakota Dealer has not been able to duplicate. Doesn't have winter floor heat like Fords. Sticker was over $40,000. 41,000 miles in past 9 months. I've always been a Ford truck guy, but this seems to be a great truck. Lots of power and handles a load well. 21 mpg when in MN at 5 mph over speed limit all day (60mph). Averaged about 16 mpg first 15,000 miles. Worst milage was into 25 mph head wind pulling load of about 26,000 pounds. Just over 7 mpg. towing, hauling, interior room, driving comfort Dmax diesel engine Alision trans. my 2000 gmc 3/4 ton 4x4 6.0 is a great truck, but i dont like the material the bed is made out of if you ding it, it will take a chunk instead of chipping the the paint. i also notice that after about 5k i hear a ping/knocking noise really bad when cold but always at the idle. overall it is a great truck it has enough power that i pulled an 18 wheeler out of the mud i had never been so proud of any vehicle. 4)2200 miles - power seat stopped working - repaired; "clunk" found to be a lose yoke of some sort. 3600 miles - truck in my hands 90 days; in shop 17 total days and counting. 92 days ownership - 17 of which were in the shop - and that number goes up every day. Nice build quality - I don't get the remarks from review sites like Edmunds or Consumer Reports that talk about "cheap" materials and then praise Toyotas! Excellent ride and handling characteristics. Very usable extended cab rear seat. While I've only owned this for a few weeks, I knew what to expect as I am generally a GM owner and was quite satisfied with the 12 year old GMC p/u it replaced. This model is designed for a job and in my case, it's to carry my family and our cabover camper. In a couple years, it will pull double duty to tow a trailer. These are far superior in ride, elegance, and handling to Fords. 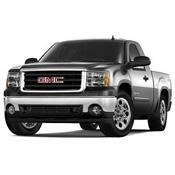 No knock on the Ford Super Duty trucks, I just find the new GM HD trucks a far better value. Replaced my still servicable but now too small 1989 GMC 2500 HD. Interior comfort. With 2 kids, the gm ext cab has the most comfortable interior, front and back, beating out both ford and dodge. Overall mechanical quality sure seems to be slipping. Feel like I have to be careful or something else is going to break. Doesn't speak very well for a 3/4 ton 4x4 ! This is my 3rd GMC and, sadly, the poorest of the 3. Previously owned an 86 and an 89. Had the 89 for 10 years and it was never in for any service outside of routine maintenance. It had the dependable 350 in it. This one has the new 6.0L. With only 26,000 miles, it has terrible cold engine knocking and ticking. Sounds like a box of rocks rattling around under the hood. Dealer says its carbon build up and to run a couple of tanks of super unleaded. Now on the 4th tank of super+ and its still rattling. Also have developed a subtle rumble in the steering column, like something is loose. It can best be felt at low speed on a dirt surface. Wheels are balanced and front end is aligned so this rumble is somewhere in the steering system. Air conditioner has quit working and the blower fan whistles on low speed. Front end squeaks on every little bump. 3rd door doesn't latch very well, particularly on very cold days. My good experience with my first two gms led me to buy this one. I will have to give very serious consideration to another make next time if this truck is an example of GM quality. More comfortable than fords and dodges that were test driven. Overall mechanical quality is lower than previously owned gm trucks. Awesome power and torque from the 8.1lt. engine. Sits lower for easier trailer hook-ups and bed loading. To light of throttle pedal-hard to feather in acceleration on bumpy roads. Tires just want to light up to easy. People always think your racing them at stop lights because you spin the tires to easy. The truck was researched quite a bit. Disregarded every one saying not to buy a first year model vehicle. The transmission (Allison) started making a noise the first week of ownership (rubbing or whinning) and I thought it may disipate. Took it to the dealer after a month of ownership and they called to tell me it needed to be replaced completely. A major swap in my estimation. Transmission is on order so I don't have the repair done on it. GMC wants this back to do R&D on it and won't let the dealer even find out what internally is wrong. I suspect the torque converter? Lots of power!Lots of places and good ground cleareance. Great ride, power for loads up to 6000 lbs, roomy inside, good sound system, clean look and easy for the wife and kids to get into. No need to have a ladder like the Ford and Dodge require. Lacks the power for loads over 6000 lbs in hilly areas, small gas tank, poor mileage. I had hopes that the 6 Liter would be as good as GM rated it. I bought it to pull a 30' 6400 lb. (Dry Wt.) travel trailer. Shortly after I got the truck and started pulling the trailer around the state (WI), I had doubts. I just returned from a 2 week trip out West and was very disappointed. They claim it has plenty of power (Rated for 9500 lbs). It has if you like driving in second gear, up a long grade at 60 mph and 4800 rpms. I feel the truck is over rated as far as what trailer weight it can handle. The ride was great without any sway but lacked power. The Black Hills were tough and the mountains were worse. The ride is great. For adults the Crew Cab seating is much nicer then the Extended Cabs. This truck would be great for trailers up to 28' and under 6000 lbs. The gas tank on the short box should be larger. You make a lot of stops when you get 7 mpg towing a trailer. I get around 13 mpg without when I drive 70/30 highway/city. Not the best by far. I haven't had any trouble with it. If it wasn't for the price tag and new design I would love the Duramax Deisel. That's what I may step up to. I had a 98 Chevy 1500 with the 5.7 liter. This truck was to light for the trailer. I believe the 5.7 with a 4:10 rear end would do the same job the 6 liter does. Crew Cab vs. Extended Cab, No match. You people with a family, do them a favor and go to the Crew Cab.